An increasing number of grant-makers are choosing Salesforce as their grant management solution. Whether they have outgrown existing built-for-purpose software or they are replacing manual processes driven by paper mountains and spreadsheets, Salesforce offers a compelling and refreshingly flexible alternative. Hyphen8 is a Salesforce implementation partner with broad and varied experience designing, delivering and supporting Non-profit implementations. In particular, we have developed a myriad of different grant-making solutions for organisations such as Esmee Fairbairn, The Robertson Trust, UK Community Foundations, Barts Charity and more – and are privileged to hear first hand about the resulting improvements to speed and efficiency. 1. It’s not just about grant management! Salesforce is the world’s leading CRM solution – so it comes with a rich array of out of the box features to manage all of your internal and external target audiences; relationships, connections, activities, segmentation and communications. Unlike software designed purely to manage grants, you can also use Salesforce to manage marketing, development and internal operations or integrate with other systems to streamline the flow of data across all of your business processes. With ever changing needs to deliver new grant programmes and strategies, Grant-makers need database solutions that can be easily and quickly adapted to meet the requirements of new fund holders, manage additional philanthropic initiatives such as social investments, fellowships, pro bono services, not to mention fundraising and development. Salesforce can be tailored to do pretty much anything so developments can be phased to suit your timescales, priorities and budget. Once the core processes are embedded, you can choose to add further bells and whistles over time. 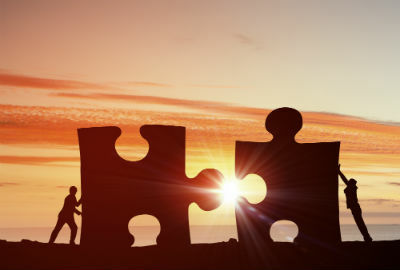 With “point and click” configuration, every aspect of your solution can be tailored to suit the specifics of your end-to-end grant management requirements. Internal champions can be trained to manage the core administration and if you need more complex development or integrations, you might choose to outsource to an external expert – i.e. a certified Salesforce partner like Hyphen8! 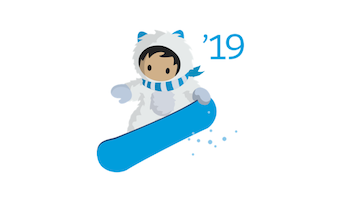 If you need to explore more advanced functionality, Salesforce offer a market place (called Appexchange) that lists thousands of specialist 3rd party applications that can simply plug-in to the Salesforce platform. It is important (more so in light of GDPR) that you are able to demonstrate robust and compliant data management processes. We work with clients to make best use of Salesforce’s core data management features to find, track, update and extract key information and maximise data quality. Capturing data online enables significant time-savings for applicants, grantees and internal teams. There are a wide variety of online data capture solutions to create, validate and update records in Salesforce at each stage including online grant application forms, endorsements and peer reviews, grant acceptance and grant monitoring reports. Hyphen8 has the experience to guide you to the right solution for you (including our own integrated form solution). Automation equals speed and efficiency. Why spend so much time searching, chasing due grant payment requirements, manually changing status values, sending standardised emails and updating your list of tasks when these can all be done automatically? The flexible automation tools that come with Salesforce allow you to control and drive the processes that you want – triggered on specified criteria that you set. Grant Managers spend a lot of time creating documents! Whether these are grant award letters, grant summary papers for Board Meetings, or internal meeting minutes and reports – all documents can be generated from Salesforce, cutting out many hours of administration time. Many of these can be driven by templates to merge data captured during the application and assessment stages and then personalised where relevant. Arguably the number one attraction of Salesforce is the ability to create and customise a range of real-time reports and dashboards – for metrics such as Total grants by type, by time period, by fund, by status, towards budget. 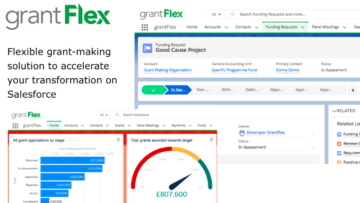 Produce charts instantly to analyse grant impact, demographics that can be used to feed trustee and annual reports and to inform decision-making. One of the common reported benefits of introducing Salesforce is that the time-savings frees up Grant managers to spend more time with grantees and prospective grantees. As Salesforce can be accessed on any mobile device and from any location, grant teams are not tied to their desks and so can access and update data while they are on visits, or at home. With shared visibility of cross-organisational data, the opportunity for internal collaboration is significantly increased. For grant-makers who operate from multiple locations, with part time staff or whose staff are either out on visits or working from home, Chatter (Salesforce’s in-built social networking app) is a powerful way to share information and updates. And, with Salesforce Communities, you can set up an online portal to share data and engage with external audiences such as assessors, grantees or donors. In summary, the Salesforce platform offers a robust and flexible solution that will enable you to transform the way you process and manage your grant-making functions – and create more capacity for you to spend time on engaging with your audiences, and less on administration! If you are a grant-maker and would like to discuss how Salesforce can help, get in touch and we can show you how other organisations like yours are benefiting.